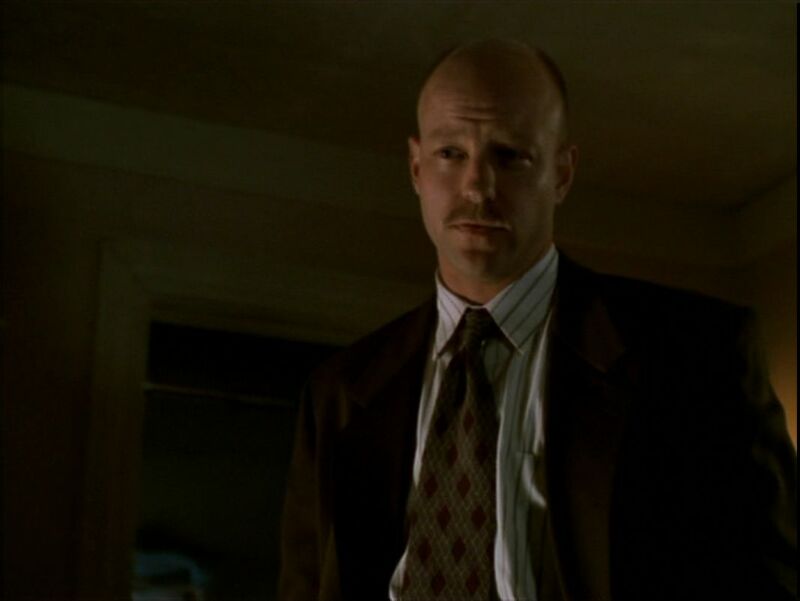 Detective Paul Stein is probably the least-celebrated recurring character in all of Buffy. He’s the cop who investigated Buffy’s involvement in a suspected murder in Ted, and then again in Becoming, Part 2, and then yet again in this episode. Each time, he has a thankless task: to ask Buffy Summers to account for the ways in which her fictional world doesn’t mesh with reality. We take it as a given that Buffy cannot speak truthfully to him, she must hide the supernatural world of which she is a part. There is little reason for this discretion, given the world the show has presented to us – the high death rate joked about in numerous episodes, the constant weird events and monstrous deaths in the town, the fact Stein’s boss is actively covering up vampire activity. The real reason she must hide the supernatural world is because the structure and metaphor of the show demand it; if Buffy told the truth, and Stein was allowed to act on this in a realistic way, the whole world of the show would shift. And that can’t happen, because the show is called Buffy the Vampire Slayer. So Stein is (inadvertently) trying to break the show, and Buffy is trying to defend it, and we know she must succeed so the show might continue. Why is Stein there at all, then? What’s the point of bringing him in for a conflict with a foregone conclusion? The answer is the episode’s title, Consequences. The show has committed to realistic emotional consequences since the beginning, but it has always played pretty fast-and-loose with other types of consequence. Here, however, it has trapped itself, since the emotional consequences arising from the accidental murder of Allen Finch can only work if real-world consequences are allowed to play out as well. The show says Faith has crossed a line by killing Finch, and that charge would feel weightless unless the world around the characters endorsed it with a police investigation. I argued last episode that Faith killing a human, not a vampire, was a cheat as an ethical line to divide Faith and Buffy. This show now presents monsters, vampires and demons as persons, so it’s on shaky ground when it says killing monsters is fine but killing humans is unthinkable. The presence of Detective Stein here is a clear marker of this odd double standard. It’s all too easy to imagine Stein, if made aware of the existence of demons and vampires, applying his diligent questioning approach to seek out the cause of a suspicious death even if the victim was a monster. And this is a real, deep, powerful conflict for Buffy, because it strikes right at the core of Buffy’s greatest flaw. Buffy’s instinct to take on too much herself, to refuse help from her friends and bear the brunt of risk and pain alone, has got her into trouble before and will get her into trouble again. Buffy’s refusal to be honest with the police is simply more of the same. The conflict between Buffy and Faith that splits them apart in this episode is not the risky vs cautious angle the show’s been playing all season, but something much more powerful. The question is, when you have the power to sit above the world, must you sacrifice yourself to it? Buffy spent season one convincing herself that her answer was yes. But what right does Buffy have to tell Faith to make the same decision? It’s meaty stuff, a big question with no clear answer and lots of provocation for story. It’s the kind of question you can only get to in your third season, relying as it does on a deep understanding of your characters, your themes, and your world. It’s a conflict so good that it makes Faith retain some sympathy even as she turns to the dark side in this story. And that dark side is, of course, the Mayor, the embodiment of someone with the power to sit above the world who has not the slightest intention of serving it. The show is dropping the key parts of this season-long story arc into place just in time for a heck of a run to the season finale. This is gripping, mature, sophisticated television. * Poor Cordelia is still filling in time until the end of the season, but her flirtation with Wesley is amusing at least. * Another lovely reversal where we expect Faith’s lie that Buffy was responsible will put her at odds with Giles, but he saw through her immediately. * Xander actually gets some great stuff here. He goes to talk to Faith to try and get her to open up to him, and it is a horrific misjudgment on his part as Faith assaults him. In the process he also hurts Willow, who divines the reason for his approach to her and cries in the bathroom. * Alas, Mr Trick. We knew him, Horatio, but not that well. An underserved bad guy, wasted to put over the Faith-turns-bad storyline. Bother. * Does Faith kill Trick selfishly or selflessly? Does she do it because Buffy’s in danger, or so she can create an opportunity with the Mayor? Or both? I don’t know. I think the show wants us to think she did it selflessly, then stun us with the revelation that her motives were different all along. It doesn’t come across clearly, however, and my assumption (on first viewing and now on another look) is that Faith killed Trick to save Buffy, but then thought about it and realised the Mayor might have a place for her. Posted by morgue on Sunday, October 25, 2015, at 9:19 am. Filed under Buffy. Tagged Buffy. Follow any responses to this post with its comments RSS feed. You can post a comment or trackback from your blog. I find this Buffy highly unlikeable: selfish, self-absorbed, crybaby, doling out kicks in the face to those who are already beneath her (Xander, Wesley). Some of these are the same personality traits that make her seem strong, independent, even witty, when it’s landed right, on demons trying to kill her, not her friends trying to be sympathetic and her watcher admitting he got it wrong. That Giles immediately turns around and says, hey sometimes slayers accidentally kill people, it’s not the end of the world, is a note of maturity that should hit all of Buffy’s melodramatic posturing on the head. Except that then he decides to go to the group of teenagers to ask what to do next. Wait. What? Didn’t Willow already send Buffy to you to sort this out? So Angel is the only one able to talk to Faith on her level. Apart from the Mayor. yeah, I see all of that in this episode. I still like it and think it works. Hmm.